A couple of weeks ago Hasan had a cough and I didn't send him to school that day. Usually he has cereal for breakfast. On the weekend he asks his dad to make him "yellow unda (egg)". He only wants the yolk and he makes his dad pile on the black pepper. I cannot believe how much black pepper he wants. I've tried making him "yellow unda" but apparently I'm no good at making it. So since we weren't rushing off to school he wanted something besides the usual cereal. He decided that he wanted pancakes. So I pulled out my Joy of Cooking book and looked up the recipe since I have such a horrible memory and can't remember it off the top of my head. This time I decided to replace some of the all-purpose flour with whole wheat and I used vanilla bean paste instead of vanilla extract. These were the best pancakes I've had. When we go out to eat breakfast Hasan usually will get pancakes but I've always found them to be rubbery and lacking in flavor. Not to mention they only have some sweet syrup to eat with the pancakes. If you make these pancakes PLEASE eat them with MAPLE syrup....not that sweet sugary stuff. When writing this post I couldn't decide what to call these....at first I thought of calling it The Best Pancakes but I felt uneasy making such a claim. I loved them but would others. I thought about calling them just Pancakes but that seemed boring. I considered calling them Whole-Wheat Pancakes but thought there was too little whole-wheat flour to call them that. So I pestered my husband on what I should call them....he suggested 1/3 Healthy Pancakes since the flour in this recipe is one-third whole wheat flour....so that is what I am calling this. I know my picture isn't the best. I don't know how some bloggers do it....it's so hard with kids and I don't want to eat cold pancakes because it feels like it's so much work to set everything up...I just want to eat! Whenever I do eat Bilal is always running to me for little bites so that makes it even harder to take a picture. 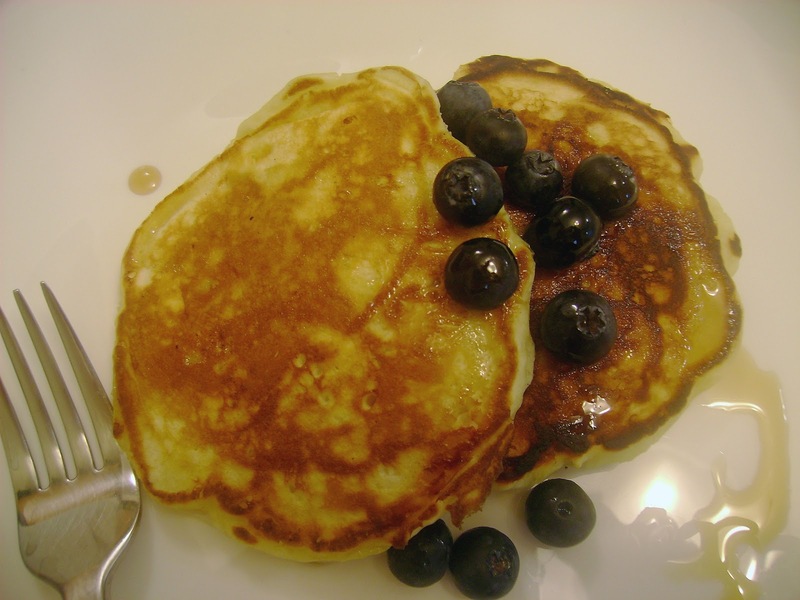 You can easily make these chocolate chip or blueberry pancakes. Right before you flip the pancakes just sprinkle the desired about of chocolate chips or blueberries. I made half of this recipe which made about 6 pancakes. In a large bowl, whisk together flours, sugar, baking powder and salt. In another bowl combine milk, margarine, eggs and vanilla bean paste. Add the wet ingredients to the dry ingredients. Using whisk combine with a few quick strokes. Don't overmix. Heat griddle (I used a non stick skillet). When it's hot enough if you drop a little bit of water it will bounce up. It if sits and boils it's not hot enough. If it evaporates right away it's too hot. I always spray some oil to make sure it doesn't stick. The recipe doesn't say to do this but I'm always paranoid that things will stick. Add 1/4 cup batter to pan. When bubbles appear and start to break they are ready to flip. If you are adding chocolate chips or blueberries this is the time to sprinkle them on. Flip pancake and cook until other side is nicely brown. Serve hot with some maple syrup! Thanks for your comment.. your blog is fabulous with amazing recipes... pancakes look delicious.. and healthy as well.. glad to follow you too..
Woww wat a catchy and yummy pancakes, amazing! Homemade pancakes are the best and you're right the ones at restaurants don't really have any flavour. These look GOOOOD. Do you absolutely need to add sugar in these? Could I substitute with applesauce since I try not to eat table sugar? @Rafia: I wouldn't use applesauce. It will thin out the batter. Have you heard of Sucanat? It is sugar in it's most natural form. It also has iron, calcium, vitamin A, vitamin B6, potassium and chromium. I've never used it so I couldn't tell you much about using it. I've never seen it in the grocery store here but I'm pretty sure you can find it at a health food store. You have so much variety in American grocery stores you might be able to find it there. Yeah, I'm thinking I need to go check out Whole Foods. I'm pretty sure they should have it. I'm sure it would be rather expensive, but I think it'd be worth it. Like I am not opposed to using raw honey (since it's not been pasteurized) or jaggery (which to my knowledge is directly from the cane), but I have this inkling about table sugar. Not as bad as those artificial sweeteners that are just chemicals, but I'm starting to see the negative effects of table sugar and so I've tried to cut it out completely from my life. Most people don't understand, but I need to do what I need to do in order to be healthy. Looks delicious and so yummy pancakes! I've got some awards for you..:) drop by to collect it..Cheers..! Interesting name for your pancakes, looks very delicious.